Wow! Looking for an exceptional opportunity? Quality home with a huge mature corner lot of green. 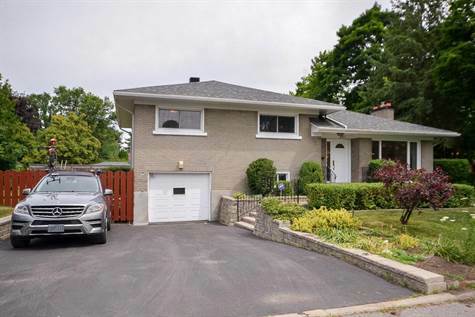 This bright side split home has been lovingly maintained and shows exceedingly well. It features a new roof, large updated vinyl windows, R40 insulation, rebuilt chimney, fully fenced lot, meticulously maintained brickwork and grounds, an oversize lot PLUS a massive 4 car driveway + heated garage with inside entry. Perfect hardwood flooring on main and second levels, 4 beds above grade, 2 full baths above grade, a cavernous basement, along with an updated electrical panel, a fully landscaped entry, a huge patio and a beautiful fully fenced side yard and raised front yard that are the envy of the neighborhood. This home is unbelievably clean throughout. What an opportunity for the savvy summer buyer. With tasteful updates this property would be a 10! Identical home on Haig in a far weaker location sold for close to 600K a few months ago!